Coca Cola in Japan has announced that it has voluntarily been striving to reduce power consumption in its vending machines in an effort to address the power shortages that have affected Japan since the earthquake. They have committed to continuing this effort during Winter. The effort will run from December 2011 through until March 2012 and will conduct energy saving measures by stopping compressor functions in the peak hours. They will also further reduce power usage by reducing the amount of lighting used on the vending machines on the illuminated models outside during the day and will switch off all lighting 24 hours a day on vending machines that are installed in doors. A spokesman for Coca Cola Japan said in a press release, "We will consider appropriate measures for other areas while taking into consideration the condition of power provision and the views of local and national governments as well as those of the power companies." It continued, "We have introduced roughly 150,000 heat pumps in the Coca-Cola system, and have been strongly promoting energy saving in vending machines by introducing vending machines that especially reduce energy consumption such as "ecoru/Solar" and "green roof" vending machines." The heat pump technology mentioned is a technology which actually absorbs the heat from the surrounding atmosphere and converts it into electricity by using a compressor. Effectively, it means that vending machines with heat pumps can use the hot air expelled when cooling products to be used to heat up other warm goods in the vending machine. 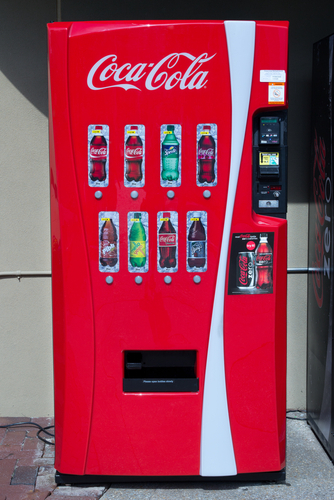 Since the announcement, Coca Cola have also decided that starting in 2012 that, wherever possible, new vending machines will have LED lighting for the product displays which use much less energy than standard light bulbs. They are also looking for further ways at producing vending machines that use less energy without compromising the user experience. It is expected that these new energy saving advances in Japan are likely to be used across the world in all new Coca Cola vending machines as a means of protecting the environment and costing less money to run.